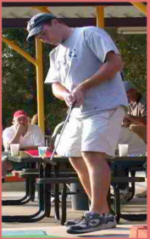 1 May 2004 - White Lake, N.C. - It took aces on the final three holes of regulation for Ray Guthrie to win his second North Carolina tournament of the season this past Saturday night in White Lake. Guthrie took his shared second round lead with Bill Kirby and then used a final round 26, including the three aces at the end of the round, to clip Billy Caudle by one shot for the win. Earlier in the day, players were on the course battling showers and damp carpeting. Before the first scheduled evening tournament on the North Carolina tour in three years, more rain fell, but left in time for the event to get started. Temperatures did drop considerably into the high 50's during the night. With that, the field of 36 pros and 15 amateurs made considerable adjustments and that would pave the way for tighter scores for the Pros and a lower scoring average for the tournament. Kirby jumped out in front with an opening round 23 and it looked like he would duplicate Vince Batten's earlier efforts when Batten shot a tournament record score of 73. His opening round was only leading by one shot on Guthrie and Rick Rybaczek, who both posted 24's through the first 18. Kirby stayed out in front through the second round, but now was mired in a share of the lead with Guthrie. Guthrie shot the first of his two 26's for a total score of 50, while Kirby shot 27 to join Guthrie. Caudle also fired a 26 during the round to move into a tie with Brad Lebo for third at 51. Caudle, playing in the second group, continued to blaze away as he shot another 26 to go in the house at 77. It seemed that the score would hold, but Guthrie, who was the last player on the score sheet, came back and aced four of the final five holes of play, including the final three, to eclipse Caudle and deny him of his second career PPA win. Guthrie won for the second time this season in North Carolina by one shot and would shoot a score of 76. Ironically, both of Guthrie's wins this year has come as a result of being the last player in the Pro Division to tee off. In the afternoon tournament, Batten teed off last and won there in convincing fashion. Caudle had to settle for second with that score of 77. Lebo finished tied for third with Randal Smith and Randy Carter at 78. Caudle took the State Championship and Match Play spots from this tournament. Todd Trent aced the sixth hole of sudden death in a playoff against Brian Hutchins for the amateur division victory. The two finished regulation tied at 84, with the help of Hutchins hitting the block on 17 and then made the 15 foot deuce putt to stay alive. In the playoff, both would shoot 29 and the playoff was extended all the way to hole 6. Trent made the tee shot and Hutchins' putt slide off the left rail to end the playoff. The win for Trent is his first of the year and his first in nearly three seasons, ironically last winning a night-time event on the North Carolina tour in Burlington in May of 2001. Steve Helton came in third at 85, missing the playoff by one stroke. After the tournament, there was a World Match Play spot to be decided based on the outcome of the combined score from the two tournaments held on Saturday. Guthrie's late run forced a tie with Kirby for the spot and would head to the 18-hole playoff, where Kirby would cruise 11-under to 5-under to earn the spot. The North Carolina tour will rejoin the South Carolina tour on Sunday for the Carolina's Open, which will be played at 9:00 a.m. on Sunday, May 2. Batten is the defending 2003 Carolina's Open Champion. Tournament results provided by Opie Roberts. after both Trent and Brian Hutchins each shot 29 in the 18-hole playoff.